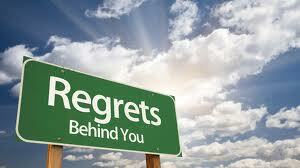 regret: verb; to feel sorrow or remorse for (an act, fault, disappointment, etc.). Got any? Whew! I sure do. But, I am learning to live in grace and if Jesus Christ is willing to shower me with His ultimate grace then I have to learn to give myself grace too. I believe that over-indulging ourselves with regret will most likely ruin our future chances of walking in victory. Not to ever say I make light of my past sins because I don’t – I think just remembering some of the things I did helps me administer more grace to others when I see them making huge mistakes. Stuff doesn’t happen “by chance” if you believe in the sovereignty of a righteous and holy God. I love 2 Corinthians 1.3-4: Blessed be the God and Father of our Lord Jesus Christ, the Father of mercies and God of all comfort, who comforts us in all our tribulations, that we may be able to comfort those who are in any trouble, with the [same] comfort with which we ourselves are comforted by God. Let’s say good-bye to regret and welcome God’s grace and mercy so we can minister those things to others. We can all do that in some way or another. We all have natural tendencies to skills and talents. My friend in Indiana ministers, every chance she gets, to people through her awesome gift of hospitality. One of my cousins ministers through her financial generosity. Another friend cooks and bakes for people in need. We can all do something to change our regrets to blessings. All of us, all of us, have regrets in one form or other but when we experience the gifts of grace we can be instruments in God’s hands to be a shelter of hope, a giver of grace to those that so desperately need it. We can help them forget their regrets and receive God’s love, grace, and mercy. My grandson and I love the song by Matthew West, Hello – My Name is Regret! What a message in this song! We are children of the one True King! Let’s start living like we are! Love this….goes right along with my “don’t look back…you’re not going that way”! Yes, that’s why it’s call past (as in passed!)! Love this, just like, Cross the Bridge, and Get Over It. We all need to do this, bury the past, and don’t let the past bury you. Yes, we all have regrets but I am so thankful that I have left them behind me and can move on in the right direction with the Love, Mercy and Help from the Lord. I love the words that Gloria Gaither wrote….sung to the tune of Finlandia….”I then shall live….as one who’s been forgiven…..” Living that way is a CHOICE! Always a choice: forget regrets or wallow in them. I choose to forget! And, I do hope you noticed a mention of you? The enemy loves to deal with our mind….he wants us to feel smaller than we really are. Only through Christ can we be lifted above the shadows and our feet set on solid ground. Heard a young pastor say one time ‘that no mater what we think of ourselves, God thinks differently’….that has helped me through many days of despair. I press on towards the mark….. I spent a lot of time wallowing in regret. It colored all my days muddy. Thankfully, Christ came and took it all away: “Come, let us reason together, though your sins are like scarlet I’ll make them white as snow”. Although there are things I would do differently, they don’t control me anymore. I set my face towards the future and try to live from this moment on. To God be the glory…great things He has done! This is so necessary…..set our faces like flint, toward the future. Yes, as in “stick me with a fork, I’m done!” We can be that way with regret too. DONE — It’s a very nice word.